What if everything we did was a little more fun? Ever since Foursquare burst onto the scene with its clever badges and simplified “mayoral” achievements, people have been going gaga for game mechanics (and Gaga videos, circumstantially). Its competitors and allies, from Gowalla and Yelp to Miso, Hot Potato and my own startup, beamME, have been evangelizing the value of points, badges, levels, challenges, leaderboards and achievements as an easy and powerful way to get consumers to engage with a product or service. This use of game mechanics outside of games—also known as Funware—is taking the social web and mobile apps world by storm. Almost every aspiring startup—and many established brands, including Chase, NBC and the US Army—are turning to Funware to deliver results that traditional/social marketing simply cannot deliver. As I explain in my new book, Game-Based Marketing, game mechanics can make any service or community more fun; and when given a choice between two similar activities, consumers will always choose the one that’s more enjoyable. But the use of game mechanics isn’t limited to things that already seem somewhat enjoyable. I always get asked the same question about how to apply game mechanics to specific, challenging product categories—and even how to make great products better. So in the spirit of fun, here’s my wishlist for the top three web/mobile apps I’d like to see “gameified”, and the three major game mechanics they should use: Leaderboards, Points and Status. Facebook. Yes, it’s the world’s most popular social network, and perhaps the most trafficked website in the U.S., but it still could be a lot more fun. Let’s take your “friend score”, for example. Most of us know exactly how many friends we have, and are keeping a running tally of our friends who have an outrageous number of connections and those who barely socialize on the site at all. 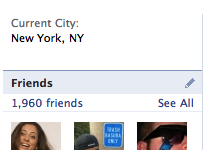 (Facebook says the average user has about 200 friends). In effect, we are keeping a running leaderboard in our minds of how our social graph ranks by popularity. But why not make the leaderboard public? Consider that Orkut exists almost entirely because of this incidental feature (the country-by-country leaderboard is what made nationalistic Brazilians sign up by the millions to “beat” the US). A socialized leaderboard would allow you to more easily gauge the popularity of your social graph and give you an incentive to make/add more connections to the service. 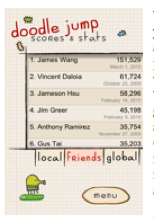 Maybe the score could be weighted to reward adding friends ho are more active on the site, or who in turn have more connections than others. A well-designed board would also let you see your relative and absolute ranking, along with a simple invitation to do just a little better (“add two more friends to beat Sam’s score”). It could even be designed to reward you for having more friends you actually interact with by scoring your behavior. Generating that kind of behavior would be a huge win-win. Having more friends generally equates to greater personal satisfaction with Facebook and in real life, while Facebook has frequently called the number of connections the most important driver of user growth and engagement. All this is possible through the simple power of the leaderboard and would further cement Facebook’s intrinsic potential for fun. Fedex. With the rise of e-commerce and simplified logistics, merchants and consumers are ever more acquainted with how to ship packages across the country and the world. After all, simplifying shipping (with things like the Free Super Saver at Amazon) has been credited as one of the most important drivers of e-commerce growth. But why can’t the experience of shipping (or receiving packages) be made more fun and social? What if Fedex allowed you to connect your social graph to your shipments, letting you see your en route packages on a game board relative to your friends? You would receive points and rankings for various shipping stats, such as total time in transit, miles traveled per day, and so on. You could “talk smack” to friends whose packages were sent via ground (or the USPS), and even choose to use points to speed up shipments already underway. You could even design it to reward “green” choices as a second level of interaction. In short, the game would have a built-in incentive to get users to choose faster shipment methods and to publicize their choice of carrier. If they wanted to kick it up a notch, they could even incorporate tracking stream data from competitive carriers (look at how much slower UPS is!) and let consumers use the power of human intelligence to do warehouse-to-destination routing calculus, a super complex math problem that could be easily made into a fun game. Suddenly, shipping isn’t just a commodity – it’s enjoyable – and it’s entirely possible with points. Amazon.com book reviews. Paul Carr recently wrote an impassioned essay about the failure of Amazon’s book reviews to adjust for consumer vigilantism. While the comments were interesting and the suggestions lucid, making Amazon’s (or Yelp’s, or TripAdvisor’s) product and service reviews more accurate and relevant can be better accomplished through the thoughtful application of Funware, rather than one-off rulemaking. In fact, Amazon’s review scheme was one of the first highly successful reputation systems, using basic badge mechanics and “flagging” to encourage and reward thorough reviews. Despite its early lead however, the review system on the site has stagnated in the last few years, with irrelevant badges becoming the norm (“Top 500 Reviewer”) and no true connection to a social graph. By taking a page from Farmville and other Facebook games, Amazon could reignite the fun of writing reviews on the site and go a long way toward eliminating the chaff that clogs up the works. The key is to associate the reviews with the social graph in a way that both friends and prospective buyers can see. Gabe just purchased Game-Based Marketing on Amazon.com, check out his bookshelf. This will drive friends to visit Gabe’s virtual bookshelf giving Amazon a fun way to socialize book (or other product) buying, but also ensuring that the original buyers’ friends are reading their reviews (which rarely happens today). Then, issue visual, socialized badges for buying, reading, reviewing and evangelism behaviors so that users’ status is directly connected to the books they have on their virtual shelves and what they say about them. Since we also know that badges are highly effective at creating positive status loops and desirable behaviors, Amazon could easily issue badges for a wide range of reading activities. Whether its Science Fiction book discovery or reading 20% of the available bestsellers on Barack Obama, given the scope of literature, there are a virtually unlimited number of badges that could be earned! Now, allow random buyers to browse Gabe’s virtual bookshelf (or virtual living-room, kitchen, garden) directly from the product’s page on Amazon. This will facilitate better reviewer/buyer understanding (my biggest personal complaint about reviews is that I can’t judge the reviewers taste against my own) and keep reviewers more honest because their real social graph is connected to the books they choose to keep/curate. In short, Amazon could make book discovery, purchase and review a lot more fun by using socially publicized selections and badges to their advantage. Whether it’s Facebook, Fedex, Amazon or your own startup, Funware and game mechanics can have a profound impact on how customers interact with each other and with your products. Incorporating points, badges, levels, challenges, leaderboards and achievements is a straightforward way to drive consumer engagement, even when the underlying activity isn’t intrinsically enjoyable. It’s a lesson we’ve learned time and time again—if a game mechanic is good enough, users won’t care if the theme is banal (Farmville) or the activity repetitive (Foursquare); all they care about are the virtual rewards for a virtual job well done. In our fun future, we’ll earn these virtual, social rewards for everything we do—from shipping packages to taking out our trash, from getting good grades to buying books. If the rapid success of early Funware apps are any indication, perhaps a more playful world is closer than we think.